Starter bays consist of 4 posts, the necessary number of shelves and all other necessary fixings. Supplied on adjustable feet as standard, castors available if required. 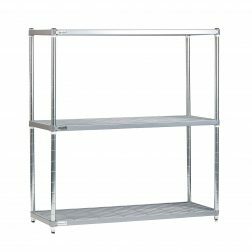 Extremely versatile solid shelving system suitable for general storage. Made from 304-grade stainless steel throughout to give excellent corrosion resistance and be very hygienic. 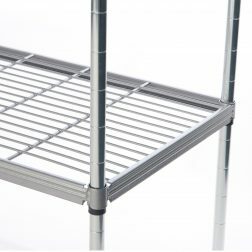 Ideally suited for catering storage and medical shelving applications due to the easy-clean channel design. The hard-wearing 304 stainless steel is ideally suited for general storage and provides superb corrosion resistance. A wide range of accessories enables this system to be configured in a variety of different ways. Bays can be made mobile by adding castors, guard rails can be added to ensure that items do not fall off, dividers installed to separate products, etc.